The International Photography Award EMERGENTES DST is an initiative and a production of Encontros da Imagem, sponsored by Domingos da Silva Teixeira company, with a prize money that will be granted to the best 2011 Contemporary Photography Portfolio. The Photography Prize Emergentes DST, will be awarded after the Portfolio Review which shall give photographers the opportunity to show their work to commissioners, gallery owners and expert editors, thus establishing solid foundations for the promotion of their work. Every creator who uses photography as main expression may apply, regardless of nationality, gender or age. 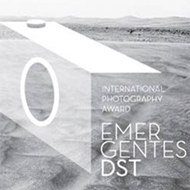 Photography award EMERGENTES DST is a prize money of 7.500 euro and an individual exhibition at the Festival Encontros da Imagem – 2012. Each applicant must submit no more than 20 digital images (b&w or colour). It must be an original and recent Portfolio (images with no more than three years). Applications between July 15 and August 15, 2011. A pre-selection from a committee of experts will select 70 authors who shall be invited to submit their portfolio to further review from specialists and photography and visual arts analysts.